It’s hard to believe the air has turned and kisses of Autumn are starting to appear! It feels like yesterday I was iced into Winter! It’s been a whirlwind Summer and I’m working on a couple “in review” posts.. but in the meantime there are lots of new things brewing for the Fall! One of the fun new things already up and running are the Online Spin Sessions being scheduled by FiberyGoodness.com. These are hour long social spin groups with specific topics of exploration. I am now one of the moderators that will be hosting sessions. Check out the link for dates and times available. 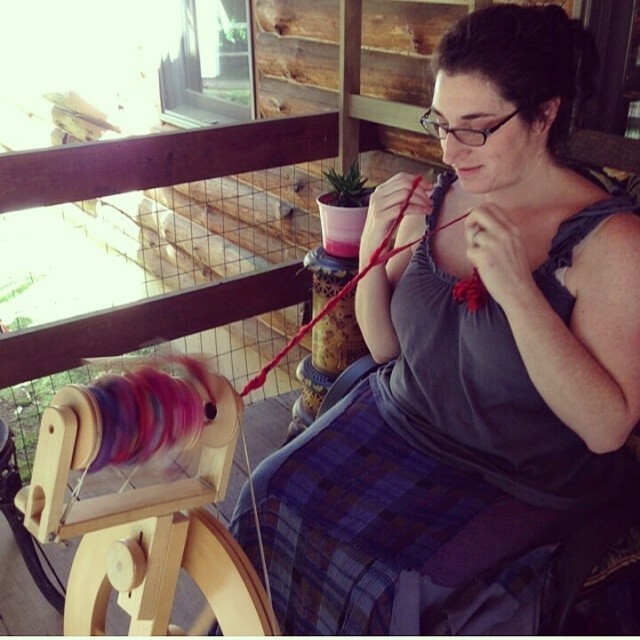 This fun lockspun and plied yarn I spun during the session I led this week on spinning locks. I am booking private online skype/google hangout lessons and design consultations, so email me if you’d like to set something up. $15 per 30 minutes. There are still spots open in my Rhinebeck and SAFF workshops, as well as my weekend at WC Mercantile in Navasota Texas! I’m excited about the workshops I have left this year. It’ll be my first time at Rhinebeck and I can’t wait to wear my new sweater! Of course I’m always excited about SAFF and there will be some new goodies in the booth this year!! I’m booking my workshops for 2015 and starting to book 2016. If you’d like me to come to your area let me know and we can look at the calender. I’ve got plans for New Orleans, Sarasota, back to StevenBe in MN, as well as up east, back to Maine and back overseas. I’m also getting lots of writing done.. so watch for new articles coming!! I have a few other things up my sleeves that I can’t yet spill.. but I promise.. the fall is going to be great.. and 2015 is going to be amazing! New posts coming next week about Weaving in Connecticut, Dancing with the Steph(v)en’s at Stitches Midwest, Cashmere kisses in Quebec and the amazing spinners and mountains in Norway!! ← Empowerment in the Cut! 10 Tips for Cutting Handwoven Fabrics!